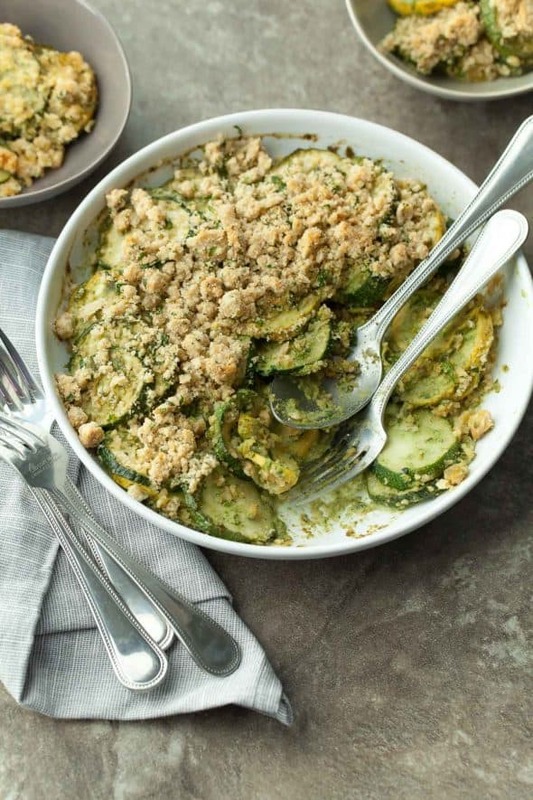 An easy paleo and vegan summer gratin filled with layers of yellow squash and zucchini tossed in a creamy herb sauce. During the summer months, I like to keep things as light, fresh and heat-free as possible. As the temperatures rise, my oven gets a bit of a rest and salads, wraps and lettuce cups become a daily affair; but if there’s one dish that will have me happily cranking up the oven even in the hottest of months, it’s a gratin. There’s such a lovely simplicity about gratins, especially when made with the best produce the season has to offer. Hearty but not overly heavy and irresistibly golden on top, a gratin is summer comfort food at its finest. 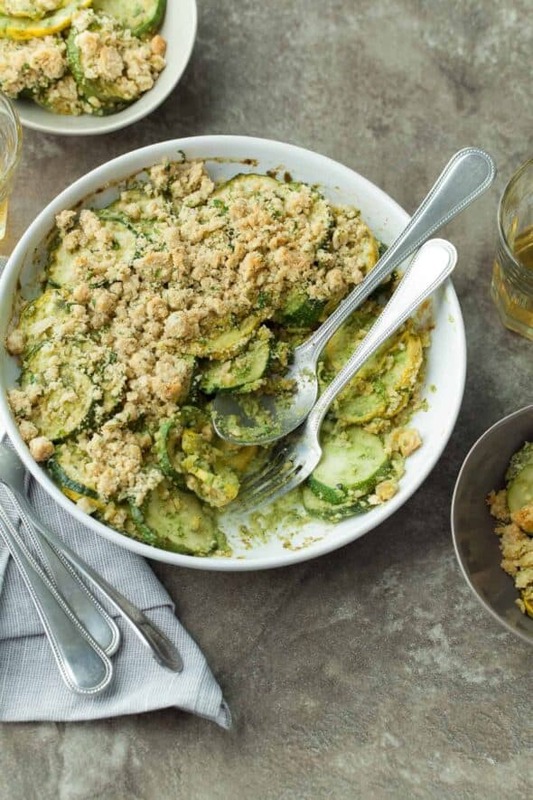 Tender and mild tasting yellow squash and zucchini are in abundance at the moment since they reach their peak this time of year, so they make the perfect candidates for a summer gratin. 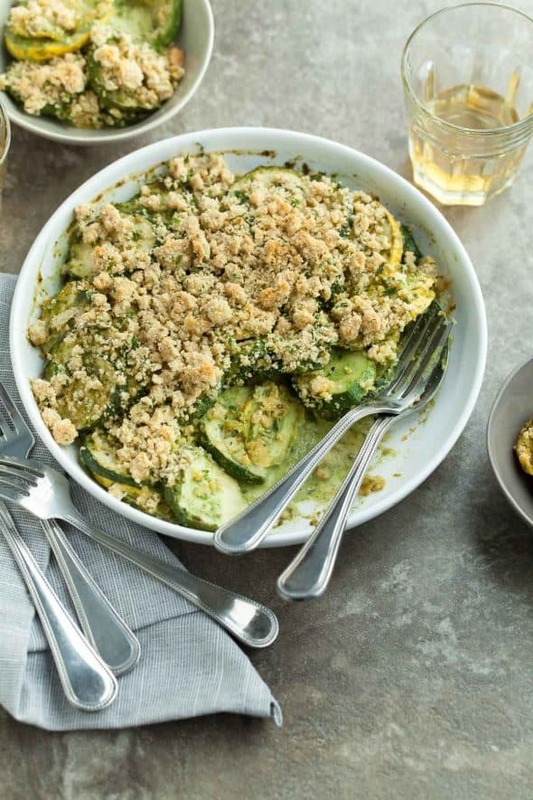 And while most gratins rely on generous amounts of milk and/or cheese, this summer squash and zucchini gratin is entirely dairy-free while still remaining delightfully rich thanks to a creamy and vegan garlic and herb filled sauce. 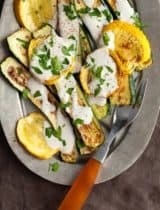 Thinly sliced yellow squash and zucchini (slender squash is the best here since the larger ones have more seeds) are tossed with the creamy sauce then layered into a baking dish. 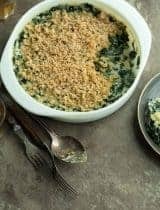 A crumbly topping flecked with fresh herbs like, basil, parsley and chives is then piled on top to create a golden crust and the whole thing is popped in the oven to bubble and bake. The tiles of summer squash soften and melt into each other in the heat of the oven, while the topping turns crisp, golden and brown. 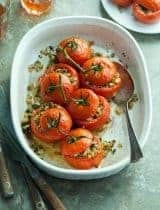 Easy and effortless, it’s the kind of dish that deserves a place on your table this summer, whether that’s entertaining with friends or just an everyday weeknight dinner. Heat oven to 375°F. Lightly grease a 1 to 1 ½ quart pan with olive oil, set aside. Combine basil, parsley, garlic, pistachios, and salt in a mini food processor. Pulse until finely chopped. Add olive oil and coconut yogurt and process until smooth. 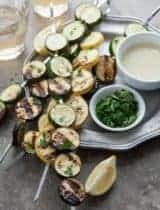 In a large bowl, combine sliced zucchini and yellow squash with herb sauce and toss until well coated. 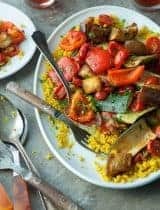 Combine topping ingredients in a small bowl and pinch together into clumps with fingers. Transfer prepared squash to prepared dish, sprinkle topping over gratin. 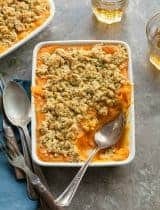 Transfer gratin dish to oven, and bake for 35-40 minutes, or until topping is golden and squash tender. Serve warm. 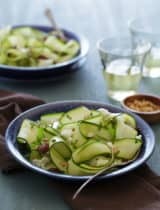 I am ALWAYS looking for ways to use up my zucchini this time of year, this looks awesome!